The Peasley girls, Barbara, Cheryl and Linda promised their mother, Kathryn, they would always have fun together and stay close. 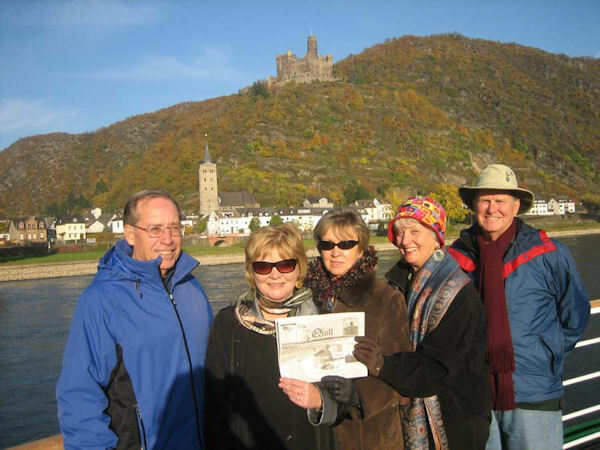 Here they are with Richard and Henry reading The Quill and cruising down the Rhine River in Germany in October 2007. "It was a little chilly, but we stayed warm as we were in Riesling Wine and German Beer country!!" When you go on a trip, take "The Quill" along, capture your picture with it, and submit it to us. Let's see where all The Quill" can go.